Abstract: In Canada there are a number of health and social services that are offered to people aged sixty and over which do not function collaboratively. Collectively, such services are said to not effectively contribute towards a learning health system (LHS). 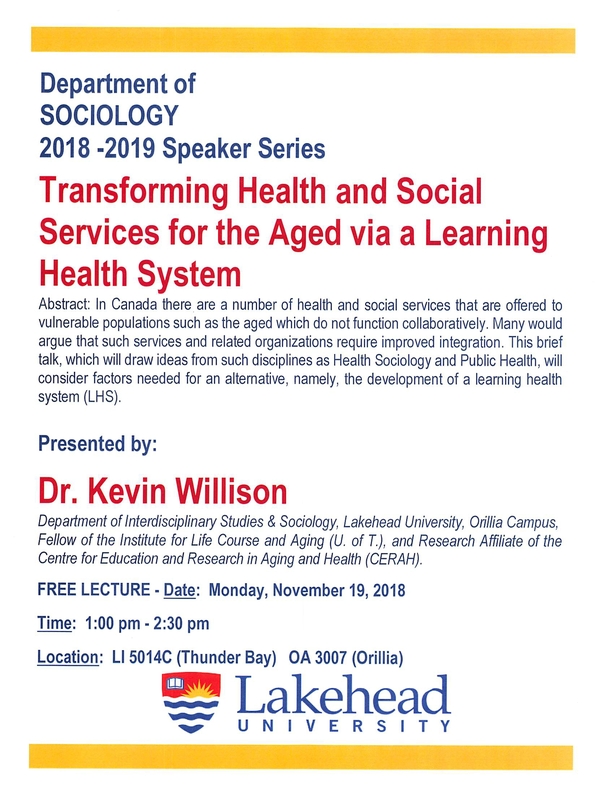 This talk, which will draw from such disciplines as Health Sociology and existing fragmented services, will consider how a learning health system may better transpire. Abstract: In Canada there are a number of health and social services that are offered to vulnerable populations such as the aged which do not function collaboratively. Many would argue that such services and related organizations require improved integration. This brief talk, which will draw ideas from such disciplines as Health Sociology and Public Health, will consider factors needed for an alternative, namely, the development of a learning health system (LHS). Fellow of the Institute for Life Course and Aging (U. of T.), and Research Affiliate of the Centre for Education and Research in Aging and Health (CERAH).